China's President Xi Jinping speaks during the 70th session of the United Nations General Assembly at its New York headquarters, Sept. 28, 2015. Chinese President Xi Jinping, addressing world leaders at the United Nations General Assembly Monday, made new commitments to uphold peace, encourage global development and support efforts to reduce climate change. In his address at the global body's New York headquarters, Xi pledged $1 billion in aid to the U.N. peace and development fund and promised to create a reserve force of 8,000 U.N. peacekeeping troops. He also announced China would give $100 million in military assistance to the African Union over the next five years to fight terrorism on the continent. China "will continue to uphold the international order," Xi said, noting the $1 billion would be distributed over 10 years to advance multilateral cooperation. The Chinese president called for embracing "dialogue rather than confrontation," declaring that nations should “treat each other as equals. ... The big, strong and rich should not bully the small, weak and poor." FILE - A Chinese Coast Guard vessel maneuvers to block a Philippine government supply ship with members of the media aboard at the disputed Second Thomas Shoal, part of the Spratly Islands, in the South China Sea. China has been accused of aggression in the South China Sea. The Philippines and Vietnam are among countries with overlapping claims to land, coral reefs and lagoons mostly in the Spratly and Parcel islands, an area harboring busy shipping routes and potential oil and gas reserves. Vietnamese fishing vessels clashed with Chinese ships near a controversial oil rig that Beijing established last year. Recent satellite photos suggest China’s land reclamation campaign — enlarging reefs into artificial islands — extends to a third airstrip in the area, on Mischief Reef. Its runway would be just 39 kilometers from a Philippine warship, the BRP Sierra Madre. The Philippines grounded the World War II-era ship in 1999 as an outpost for marines. China previously has been faulted for not shouldering its share of responsibilities in world affairs. On Saturday at a U.N. Sustainable Development Summit, Xi pledged $2 billion to a global assistance fund aiding poor countries’ development; yet, China itself remains a developing country, the World Bank notes, with nearly 99 million people living below the poverty line – the highest concentration of the poor outside of India. On Monday, Xi told assembled world leaders that "development is meaningful only when it is inclusive." He later added that Chinese leaders in business and beyond are "ready to share our development experience and opportunities with other countries, and we welcome other countries to board China’s express train to development." Until recently, China’s economic development has surged, propelling millions of its 1.3 billion residents into the middle class and vying with the United States as the world’s leading economy, the World Bank reports. China, however, has spooked global investors with its volatile stock markets and contracting growth rate, revised to 7.3 percent from an expected 7.4 percent for last year. 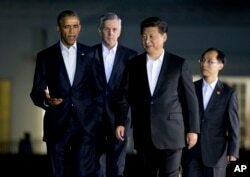 Xi assured the world leaders that his country would continue its market reforms. At the U.N., Xi also reaffirmed China’s commitment to curb climate change. In June, the country formally pledged that it would curb its carbon emissions by at least 60 percent by 2030. "We should build an ecosystem that puts Mother Nature and green development first," the Chinese leader said. "… We should reconcile industrial development with nature … to achieve sustainable development … and the all-around development of man." He also pointedly called for "developed countries to … honor their reduction commitments" in terms of carbon and other emissions. U.S. President Barack Obama, left, walks with Chinese counterpart Xi Jinping, front right, outside the White House in Washington, Sept. 24, 2015. On Friday, he met with U.S. President Barack Obama at the White House in talks aimed at building collaboration and reducing tensions between the two countries. In a joint statement, the two leaders reaffirmed that their countries "would move ahead decisively to implement domestic climate policies, to strengthen bilateral coordination and cooperation, and to promote sustainable development and the transition to green, low-carbon, and climate-resilient economies." Sensitivities are especially high around issues of cybersecurity. Ahead of Xi’s trip, Obama told business leaders that China’s alleged theft of trade secrets is an "act of aggression that we have to stop." He told the Business Roundtable that the United States was preparing possible sanctions, "a number of measures that will indicate to the Chinese that this is not just a matter of us being mildly upset." China has denied past reports linking its military units to hacking foreign targets. The Asian country also has been criticized for clamping down on free speech – on the Internet and other media platforms as well as among activists. Early this month, China’s Ministry of Public Security revealed a “special campaign” targeting 197 individuals for Internet posts that allegedly "caused panic, misled the public and resulted in disorders in stock market or society," the official Xinhua news service reported. Some were targeted for spreading "seditious rumors" linked to China’s staged events marking the end of World War II. Last Wednesday near Seattle, Washington, Xi told U.S. and Chinese technology executives meeting at an Internet industry forum that his country would work with the United States and other nations in building “a secure, stable and prosperous cyberspace,” The Seattle Times reported. He also said each country should develop its own domestic policies "in line with their national realities." Before traveling, Xi promoted his U.S. trip on Facebook, including photos of tourist spots in China; but the Asian country’s government censors block the website from average Chinese users.